Are those crashing waves the result of a tropical storm? Nope! 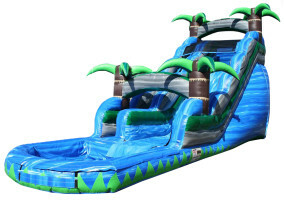 They're just your delighted party guests splashing into the pool at the foot of the 18' Tropical Tsunami slide rental. With palm trees shading the way, this slide will lead to you island paradise.